Apartments have become integral to Melbourne’s urban fabric. Many of these apartments appear cookie-cutter made, with very little difference once past the front door. 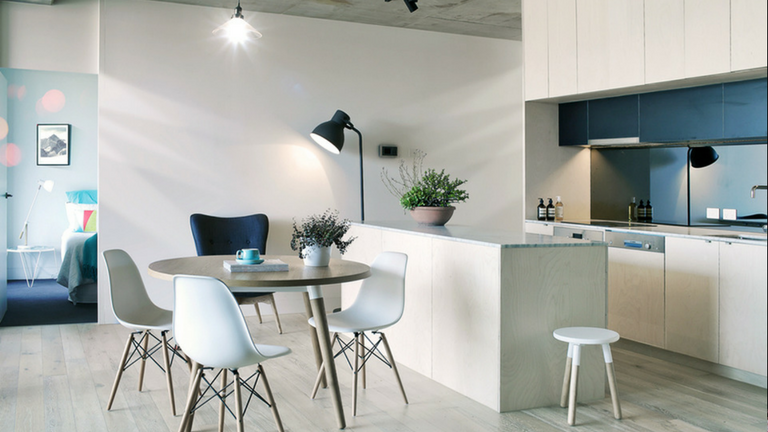 However, an award-winning development at 729-731 Burwood Road, East Hawthorn shows that with some imagination apartments can offer something completely new. Recipient of an architecture award from the Australian Institute of Architects (Victorian Chapter) in 2016, these nine apartments pick up the ‘rhythm’ of the neighbouring Victorian shops. “This was the first development for our client. She wasn’t interested in simply maximising the ‘yield’ of the site. The preference was for something more modest, one that responded to the neighbouring Victorian shops,” says architect Phil Snowdon, director of Ola Studio. “Ingrid (Wilson, the developer) wanted quality apartments,” he adds. The site (590 square metres), with a Victorian shop and dwelling, had formerly been used as a bathroom showroom. While Snowdon was keen to include a shop at ground level to continue the pattern of the shopping strip, he was also keen to ensure the development appeared in scale to the two-storey streetscape. To reduce the scale of the four-level development, as well as create privacy for the apartments, Ola Studio created a timber-battened screen on the façade, with the upper levels stepped back. “We wanted to filter the northern light, but it was also important to create privacy, particularly as it’s a fairly busy thoroughfare,” says Snowdon. As the site has two street frontages, one to Burwood Road, and the other to a wide laneway behind, Ola Studio was keen to create a ‘laneway’ effect to link the two. This link not only allows residents to access their cars (via a stacking system), but also means that they don’t have to enter Burwood Road with their cars. 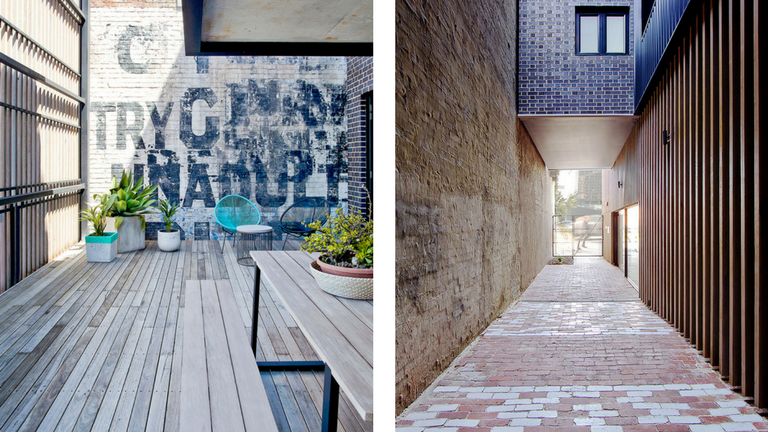 This laneway, slightly elevated, is finished in recycled bricks, originating from the former Victorian shop. “We discovered that Hawthorn bricks were popular in this area, with a brick quarry that once existed down the road,” says Snowdon. Given the history of the neighbourhood and the extensive use of bricks, Snowdon was keen to build in brick. However, rather than use Hawthorn bricks, a zinc-coloured glazed brick was used, with the rear façade featuring a ‘hit-and-miss’ pattern of bricks. “We were conscious of another apartment development (eight storeys behind) that was just about to start construction at the same time, so we wanted to filter the views and the light,” he adds. Deep perforated steel balconies create additional privacy. Residents enter the site through a laneway that leads to a secure gate. A lightwell/open stairwell, flanked by a garden, provides a sense of arrival. “It’s only a small courtyard garden, but it provides a meeting point for residents. Some catch up on the stairs, while others park their bikes,” says Snowdon, who simply bagged and rendered the adjoining brick wall. One of the rooms within one of the apartments on the first floor even appears to ‘float’ over the laneway. “It’s about connectivity and making sure residents feel as though they’re part of a community,” he says. The nine two-bedroom apartments are also configured in different ways. Organised within three separate towers (although each tower is only four levels), light and ventilation isn’t impeded. The size of the apartments also varies, from 75 square metres to 85 square metres. 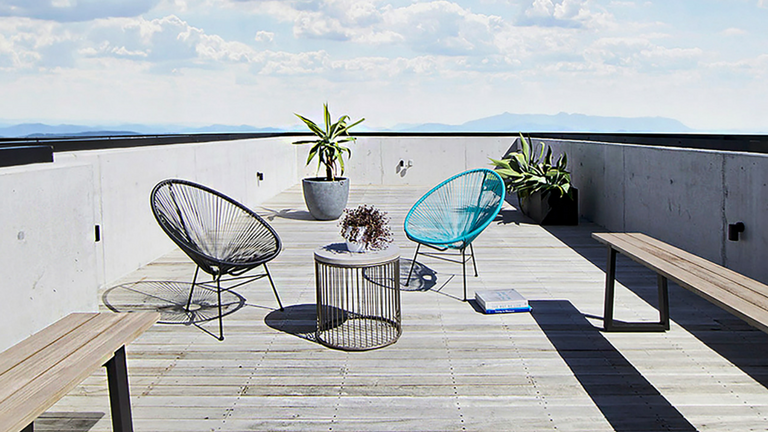 Some overlook the courtyard, while others enjoy filtered views over Burwood Road and Hawthorn’s leafy streets. The interiors of the Burwood Road apartments are also highly considered. Exposed concrete ceilings feature in all the apartments, together with limed oak timber floors. Ola Studio also used a birch ply for the kitchen joinery and on some of the walls. The birch ply also wraps the wet areas, such as the laundry and bathrooms placed at the core of the floor plans. “We wanted to keep the finishes fairly raw, not dissimilar to the treatment of the timber-battened façade,” says Snowdon, who often uses simple and inexpensive materials with a sense of craft. However, there’s also a degree of luxe, with a marble-clad island bench. While the Victorian shop was being demolished, the architects discovered a series of murals on a front wall. One of these signs advertises soap, while another can’t be exactly translated through its age. “It was quite unexpected,” says Snowdon, who thought this signage would lend character and a sense of history to this new development. Although the apartments are modest in size, as is the courtyard garden, Ola Studio included a communal rooftop garden for those wanting to entertain friends and family. With views of the city and the Dandenong Ranges, it’s an idyllic place to escape. Apartments can offer a point of difference. They can offer considerably more than repetitive floor plans and pint-sized rooms. “It’s important to have clarity in the concept and the way you connect people to a place, whether it’s indoors, or in this case, on the rooftop,” adds Snowdon. Don’t miss your chance to nominate for the 2018 Boroondara Urban Design Awards. We are looking for excellent design and high quality architecture that complements Boroondara’s neighbourhood character and heritage and enhances its public streetscapes. To nominate visit Urban Design Awards.